A charming interactive storybook app, focused on improving literacy skill and vocabulary in younger children, but with long-lasting appeal. Alpha and Betty’s Topsy Turvy World is a well-polished and well-balanced story with an intriguing plot, colourful characters and a wide variety of content. For these reasons and more, this app has received an EAS Certification of 5 Stars. Alph and Betty’s Topsy Turvy World credits itself as an animated storybook, though I would go as far to call it an episodic educational game. 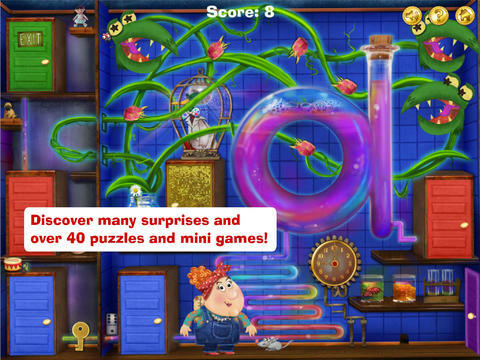 The app is the first chapter in the story of Alph and Betty, two aging and eccentric inventors, who live in a house which seems to have been designed around the alphabet. The reader must work through each room of the house, each with the theme of a different letter from ‘a’ to ‘g’, solving puzzles and, if they wish, collecting alphabetic collectibles and playing mini-games. The developers, Electric Circus, hold host to a range of talented writers, animators and many others who have worked on many well-known projects across a wide array of media. This sets the bar high from the word go; but thankfully Alph and Betty jump over that bar with room to spare. On a functional level, the app runs very smoothly. During my time reviewing the app, there were no freezes or crashes, no weird animation problems or slow-down, the experience felt very tight. On top of this, the app is very charming. The characters are well-designed and child-friendly, and casting them as scientists is a great way to explain why their house is a labyrinth of puzzling machinery and alphabet-themed odds and ends. The use of background music, sound effects and voiceovers are a great way to keep the user engaged and give immediate feedback, and the dialogue is appropriately cheesy (“blithering bazookas!”). It is also possible to turn off the voiceovers with the app’s read-through settings (“Read to me” or “Let me read”), giving the app extra replay value, as children can go through once or twice with the voiceover to learn the words and the pronunciations, and then with a parent or teacher to show what they’ve taken on-board. All of the voiceovers are recorded professionally by a British voice actor, so you can be sure all pronunciations are accurate. The flow of the app is well-defined, as each room has its own letter which can be seen handily in the background, made out of piping or another such structure. 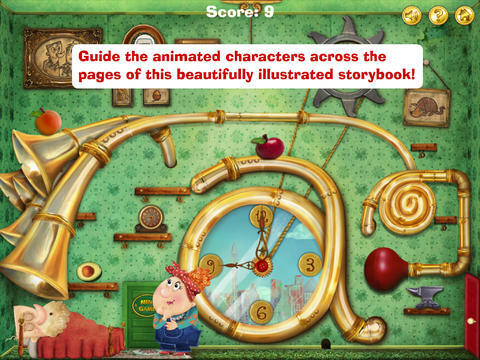 The app begins with a little introduction on how to control the characters along with a few clues on how to carry on their journey, and the characters often think aloud about what they might try next. Each room begins with a short animation explaining the setting, situation and theme of the room, so that you can take it slowly and focus on one letter at a time, but it is possible to go back and explore older rooms too. A scoring system helps the reader keep incentivised to explore, and even adds basic arithmetic into the mix. Honestly, I don’t have any real criticisms on the game, I found it very engrossing, and was even slightly annoyed when I finished it. I may even suggest they add an 18+ difficulty setting! In conclusion, a fantastically charming app that should hit the mark for younger children, but you may be surprised by how many older children play it all the way through. Looking forward to episode 2! 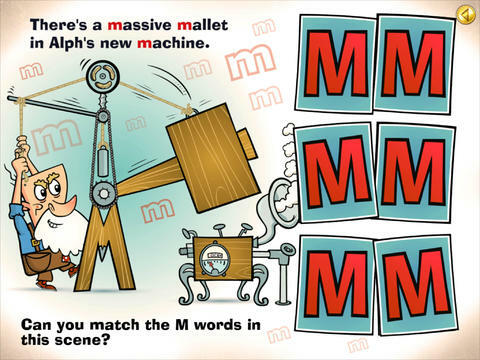 - 8 alphabet letters featured as platform games, the rest featured as mini games. - Read, listen, explore, discover and solve. 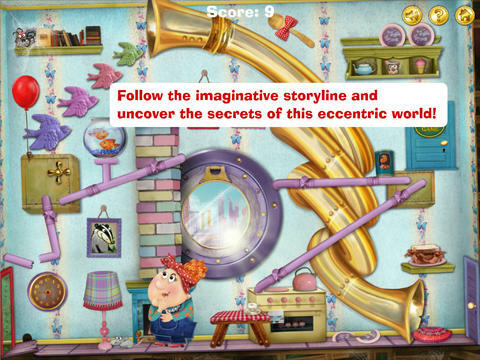 Alph & Betty’s Topsy Turvy World is a new ‘motion adventure book’. - Movies like Harry Potter and the Deathly Hallows, Iron Man 3, Who Framed Roger Rabbit. - Animated TV series for Disney, BBC, Cartoon Network and Channel4. - Traditional children’s comics like The Beano and The Dandy. - Award winning online and console games. "A fab iPad book-app..thoroughly charming"
"Lessons are learned in a responsive, beautifully realised and wonderfully ridiculous world that adults can enjoy and children will want to return to again and again." "..animation and music are very beautifully illustrated, crazy and fun! It is a very interesting unique reading experience for pre-school children." "..like a spectacular collision between Sesame St and Monty Python, in a house built by Wallace and Gromit ! Packed full of treasures that kids will love to discover ! "